(Jerusalem, Israel) — After several days here in the epicenter focusing on Holocaust Remembrance Day, and meeting with various Jewish and Christian leaders, I am flying to Amman, the capital of Jordan, on Wednesday. Given the breakdown of the Israeli-Palestinian peace talks, the crisis in Syria, the nuclear threat from Iran and the growing strength of al Qaeda — among other critical regional issues — I am very much looking forward to meeting with Jordanian officials and touring the country. My hope is to better understand one of the U.S.’s most important Arab allies, and one of Israel’s most important neighbors. At the moment, I am writing a new book in which Jordan plays a significant element, so this is another reason for the trip. As readers of this blog will recall, one of my first columns in 2014 was about the importance of Jordan’s King Abdullah II as both a man of peace and a significant agent of reform in the Middle East (see below). Last month, I wrote about my meeting with Her Excellency Alia Bouran, Jordan’s impressive Ambassador to the U.S., to prepare for this trip. Please keep me in your prayers, as well, and I will do my best to update you via this blog, Twitter and our “Epicenter Team” page on Facebook. As we begin 2014, I am going to write a series of columns on key people in the epicenter whom I’m keeping an eye on. First on my list is Jordan’s King Abdullah II. I’m intrigued and impressed with him as both a monarch and a Reformer. He is actively trying to lead his small, oil-less, but vitally important nation towards progress and freedom, tolerance and modernity. He’s keeping close ties with the Arab world. He maintains a close friendship with the U.S., and is maintaining his nation’s courageous peace treaty with Israel. He’s also actively trying to help the Palestinians and Israelis make peace, as well. All the while, he is standing strong against the Radical forces in the region. Not an easy task. The Radicals — al Qaeda, the Muslim Brotherhood, Hezbollah, and the mullahs in Iran, among them — desperately want to topple the King and seize Jordan for themselves. In the last few years, the Radical Islamists have seized Tunisia, Libya, Egypt (briefly) and are trying to grab Syria, too. Will Jordan be next? I pray the answer is no. 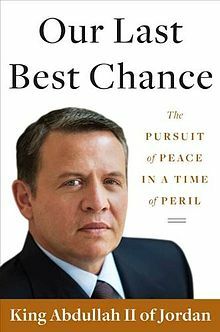 At the moment, I’m reading a book the King wrote in 2011, Our Last Best Chance: The Pursuit of Peace In A Time of Peril. I’ve also been reading several books about the history of Jordan, and about his father, the late-King Hussein, and his great grand-father, the late-King Abdullah I. I recently purchased a memoir by his father published in 1962, Uneasy Lies The Head. King Hussein was an impressive, if imperfect, Reformer in the Middle East in the twentieth century. The king’s family—descendants of Muhammad—hailed originally from the Arabian Peninsula, and for decades His Majesty was part of the Arab alliance fighting Israel. But to his enormous credit, King Hussein eventually turned against the Radicals and the violent Arab nationalists in a dramatic and impressive way. The king initiated secret contacts with Israeli leaders in the mid-1960s and maintained those contacts through many difficult and turbulent years. He did join Egypt and Syria in the fight against Israel in June 1967, a catastrophic gambit that cost him nearly half his kingdom (the West Bank), East Jerusalem, and the Old City. Yet immediately afterwards he began discussing terms for peace through back channels and secret meetings with Israeli officials. He eventually became an ally and close friend of Egyptian president Anwar Sadat, who in 1979 became the first Arab leader to forge a historic peace treaty with Israel. King Hussein also established a democratically elected parliamentary system responsible for the day-to-day governance of his small desert country. Then he negotiated a peace treaty with the Jewish state in 1994. And he did all this despite living in the shadow of Saddam Hussein in Iraq, his maniacal neighbor to the east, and in the shadow of the Assad regime controlling Syria, his despotic neighbor to the north, and despite the fact that Radicals tried to assassinate him numerous times. When King Hussein succumbed to cancer in 1999, it was a sad day for Reformers in the region. Fortunately, his son, King Abdullah II, has continued in his father’s footsteps. He signed a free trade agreement with the U.S. in 2000. He became a critically important ally of the West in the battle against the Radicals after 9/11 and during the liberation of Iraq and its aftermath. In 2006 he became the first Muslim monarch to address the National Prayer Breakfast in Washington, D.C., speaking on the importance of Muslim-Christian relations before two thousand evangelicals from all over the world. And all the while, King Abdullah has tried to move Jordan step by step in a more moderate direction politically and socially, despite constant threats of assassinations, terrorist attacks, coups, and insurrections. It has not been an easy journey, and there have been setbacks along the way. No one would describe the Hashemite Kingdom of Jordan as a full-blown Jeffersonian democracy at this point. But having visited the country several times in recent years, I must tell you that I have fallen in love with Jordan, its people, and its leaders. Both as a Jewish person and a believer in Jesus, I have never felt in danger in Jordan. To the contrary, I have had the honor of meeting safely with Reformers from one end of the country to the other. I have interviewed Prime Minister Abdelsalam al-Majali, the man who actually signed the peace treaty with Israel on behalf of His Majesty. I have stayed in the homes of Jordanians who have welcomed me with open arms, taught me about their history, and told me how hopeful they are about their future. As a result, I am deeply impressed with the significant progress the country has made over the past three decades. Indeed, it is precisely because the Jordanians have made such progress that I am worried by the Radicals’ determination to launch a jihad there, seize the capital, and create a new anti-Israel, anti-Western base camp for Iran and al Qaeda. Therefore, I pray often for Jordan’s peace, prosperity, and continued progress. I pray for King Abdullah’s health and safety, and I pray that God will grant him the wisdom to know how best to move forward in such challenging times. As 2014 gets underway, I hope you will, too.